Mark will be running Ambush Sunday this week as I will be at Indiana University visiting my son Will this weekend (it’s the Illinois-Indiana football game at Indiana, so I’ll be wearing my orange and blue and cheering for the visiting team). 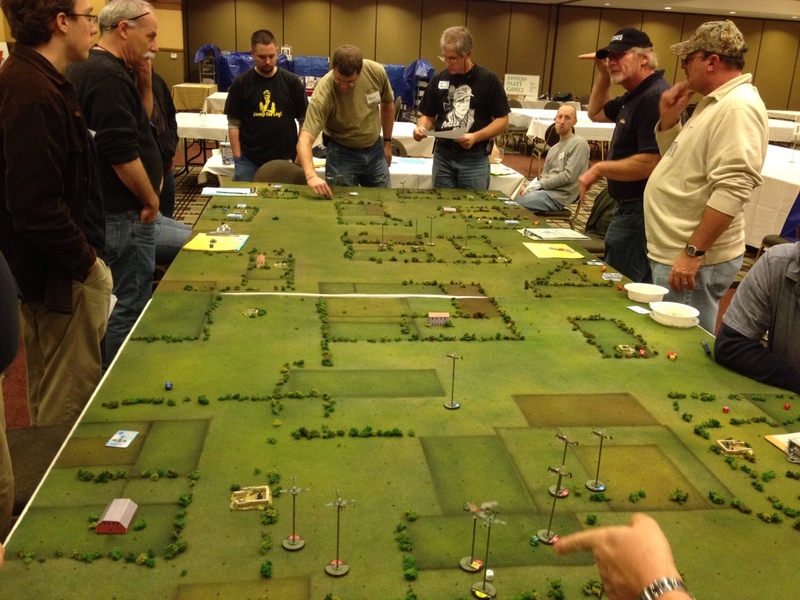 Mark is planning on running a Tomorrow’s War scenario of his own design, so come on out and support Mark at 1 PM on Sunday at Unique Gifts and Games in Grayslake, IL. Shawn Carpenter has asked me to wrestle the Tomorrow’s War point system to the ground, so I’ll be playing with my spreadsheet over the next few weeks and then submitting my draft for review by the Ambush Alley Games play testers. As we’ve said many times, we’re looking to put together a system that helps people write and balance scenarios, not a comprehensive system for tournament play. Ken G. and I already have a good start on things, so I’m hoping to have a draft by the end of the month. Skip Peterson is starting to get things going for the upcoming Legends in the Fall game convention and I’ll be helping him organize the event and some of the festivities. I will be attending as a vendor this year, representing Ambush Alley Games. I will be running games at our booth, most likely Cold War Gone Hot scenarios and Tomorrow’s War stuff. I do know of two games being run for sure. First, my son Will is running a Tomorrow’s War game set in his alternate Fallout timeline. Second, the Roots’ family tradition of running Starship Troopers will continue. My two sons (Will and Steve) will be running the game this year. Again, we’ll be using Tomorrow’s War as the rules system. 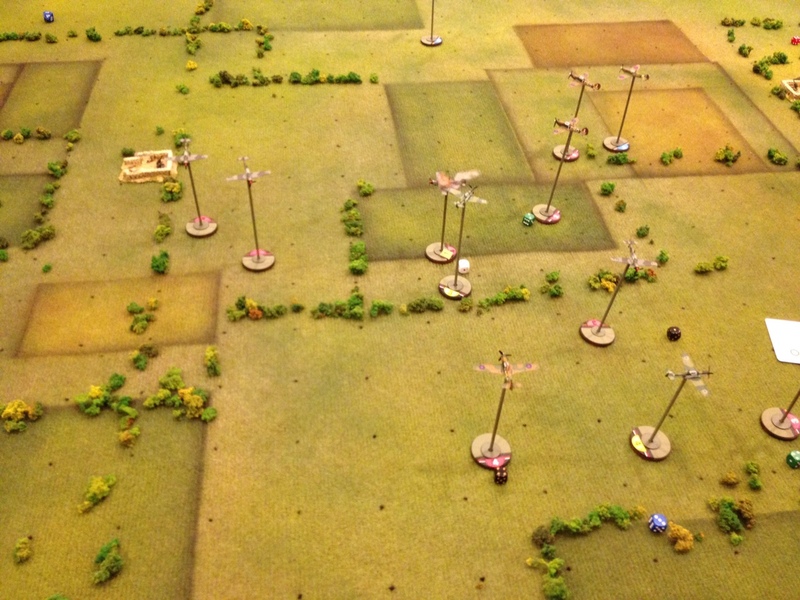 I’ve put together the planned scenario list for next year’s Force on Force expansion Contra! Wars of the Americas and have started writing. As I’ve mentioned before, the time frame will cover Bay of Pigs (1961) to present day operations. On the painting table, I’m working on two projects. The first is my 15mm Neo-Soviet VDV platoon for Tomorrow’s War. I’m nearly finished. The figures are Micropanzer’s SAS troops, which I’m painting in a summer Russian VDV camo pattern. As a tip to “fashion,” I’m giving them the dark aqua berets. 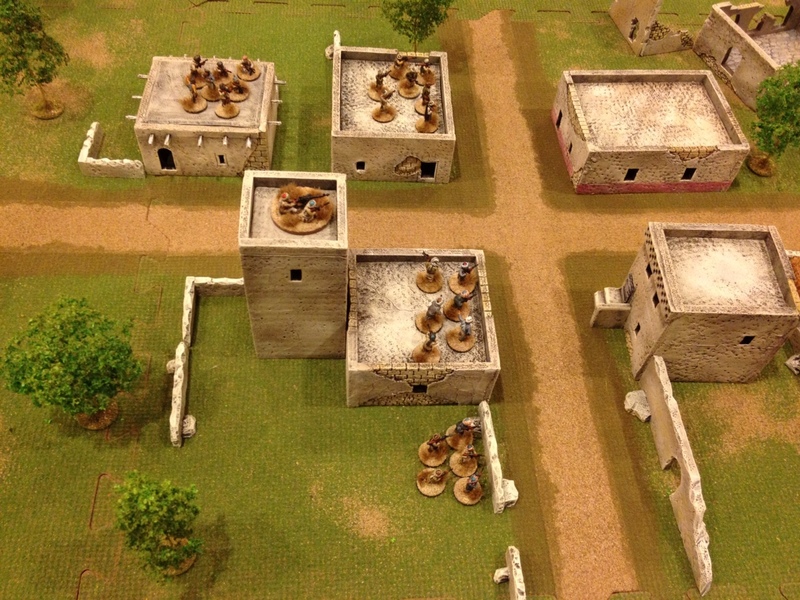 The second project is a 15mm US rifle platoon and about 50 main force Viet Cong for the release of Ambush Valley. I’m using a mix of Flashpoint and Battlefront figures for the forces. For the most part, the figures are good; there are a few sculpts that need some work, particularly the Flashpoint VC RPG figure and a few of the Battlefront US riflemen (legs too skinny and prone to snapping). Another two weeks, time for another Ambush Friday! 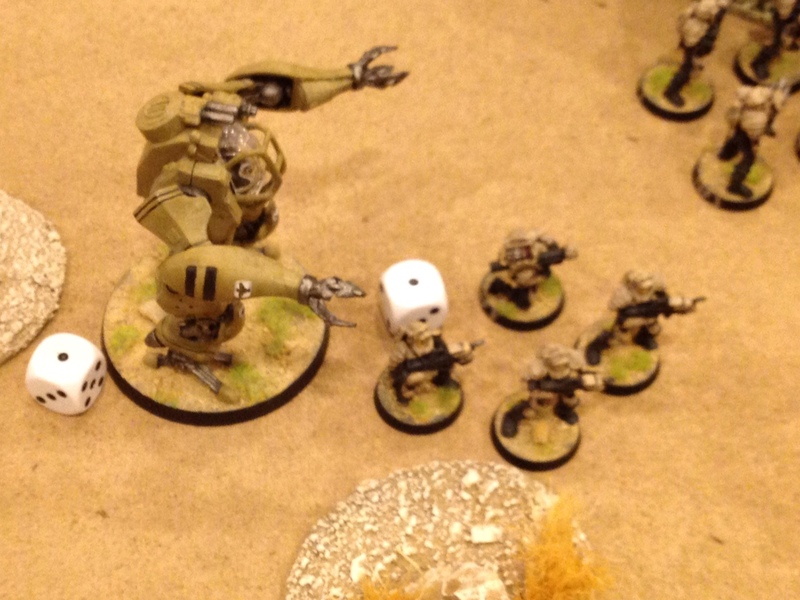 This week we will return to a familiar setting and run Starship Troopers using Tomorrow’s War rules. My son Will has spent quite a bit of effort converting all the old Mongoose figures to the new stats and rules. Based on the comments from our recent game at Legends, he’s done a good job. As always, game time is 7:00 PM. Location is 82 Center Street, Grayslake, IL at Unique Gifts and Games. Sorry that I have not posted for a few weeks, but I have been very busy getting ready for Legends in the Fall, which took place on November 14. First of all, congratulations to Skip Peterson and the convention staff for a near flawless performance. We had good weather, good logistics and good organization for the day. Despite a parking lot/paving glitch, we had a record attendance for the day. I think the final head count exceed 200 people. Second, thanks to all the game masters who once again showed the best looking and best run games in the Midwest. Hats off to Mark Feldman for yet another pulp masterpiece, this one set in late war Germany with Russians, Americans, Germans, zombies, aliens, rockets and other craziness that was another crowd-pleaser. Also notable was Ivor Janski’s World War I game set in October 1918, replete with fall trees, trenches and well-thought scenario-crafting. The Cold Cannister and Steel crowd had a good attendance. 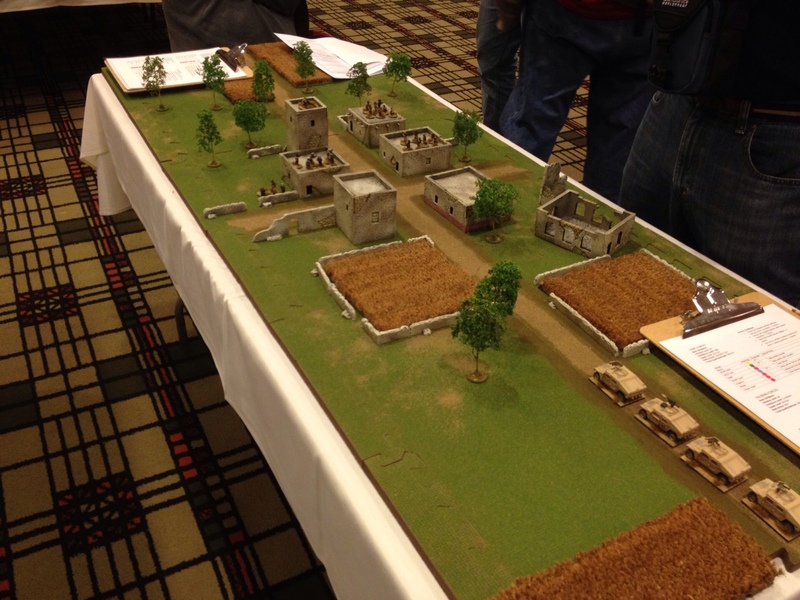 The afternoon session featured an excellent 1/35th scale Alamo game, using Conte Collectibles terrain and figures. 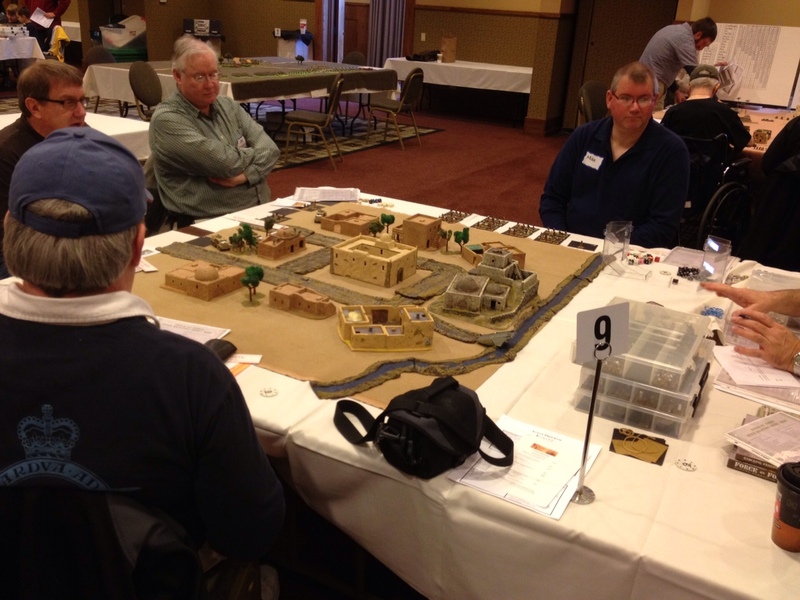 There was also a 90mm version of Command and Colors Ancients played on the table next to me. My Uncharted Seas fleets sailed under the command of Ken Wickes from Unique Gifts and Games, whose staff ran several demos of the game. Our two games went off without a hitch. My son Will ran Starship Troopers to much fanfare. This marks the fifth consecutive year that we have run the game, and in fact, Skip told me that we are the only game that has run at every Legends event since its inception. The Bugs made a meal out of the Mobile Infantry this time, so no new citizens will join the ranks of the Federation. Our Lord of the Rings game went well, but not as expected. The charge of the Rohirrim was stopped cold by Uruk-Hai well-positioned pikes and horrendous die rolling by the horse lords. Erkenbrand, Gamling and Eowyn had to beat a hasty retreat from the Westfold back to Meduseld. The highlight of the game for me was the Isengard Troll and an Ent from Fangorn playing catch with a large boulder for most of the game, each trying to wound the other to no avail. I’ll try to post some pictures from both of the games later in the week. Legends in the Fall is coming up at Trinity College on Saturday, November 14. The college is located in Deerfield, IL, and represents a new venue for the convention. I have been running games at this biannual convention since its inception. 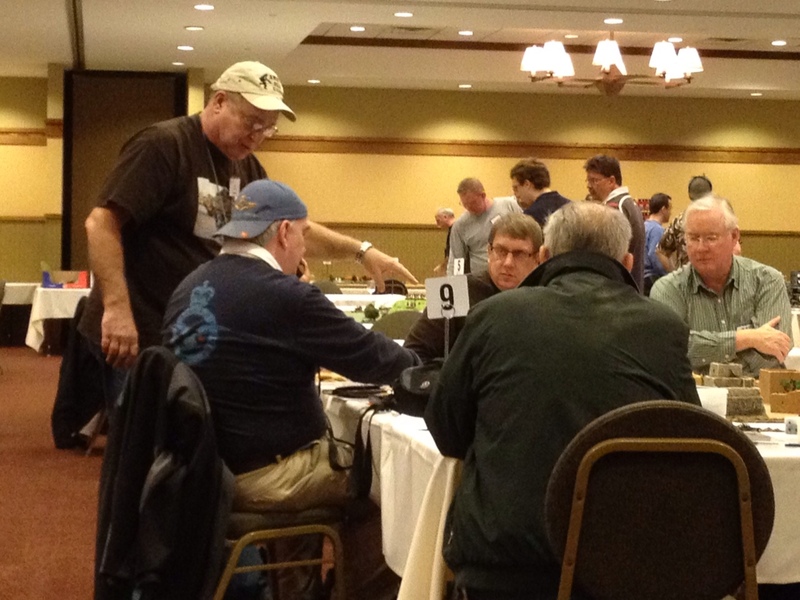 The crowd is a good group of people and the gamemasters represent some of the best in the Midwest. I will be running two games this year. First, my son Will and I will be running Starship Troopers again (we’ve run at least one game every convention). We’re still working out the scenario. Second, I will be running Lord of the Rings, using all this terrain and miniatures I have been painting. The scenario will be set in Rohan (see earlier post) and should be a lot of fun. Check out the Legends in Time link on this page to get more details about the convention. Hope to see all of you there. Well, I should know better…we had way too many folks show up to play! Thank you to everyone who came out and played the game. I ended up splitting the Mobile Infantry into half squads to accomodate all the people trying to “earn Citizenship through Service.” The scenario was a retrieval mission; a small force of MI started on the board and waited for the retrieval boat with reinforcements to land. 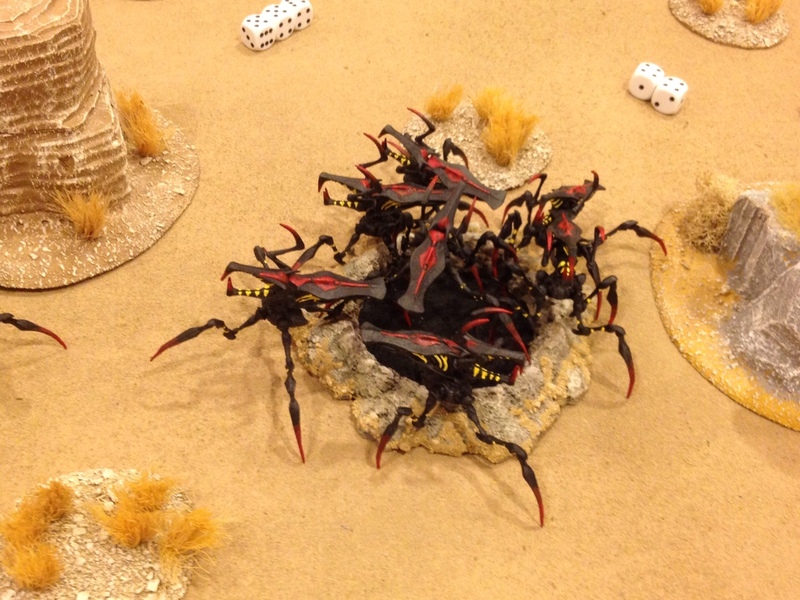 Overall, the Arachnids (played by the referees) had a bad day. 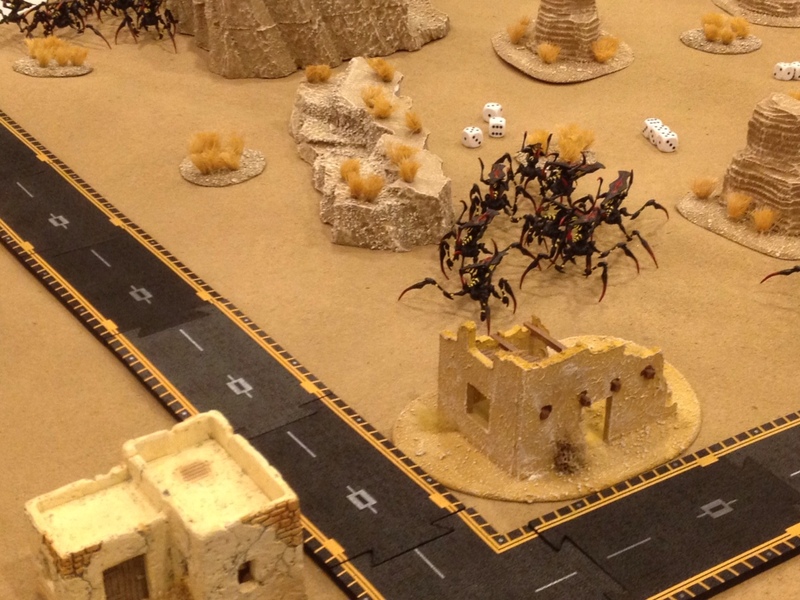 Well placed fire and a timely PeeWee atomic nuke broke up the Arachnid assault. Casualties for the MI were light, entailing two troopers and two Grizzly Suits. We’ve had a lot of requests since last Saturday to run additional events, so I am working with Ken at Unique Gifts and Games to schedule the next event.